Begone, bread! The classic peanut butter and jelly combo is no longer restricted to the square constructs of white, wheat, or rye. Enter the waffle. 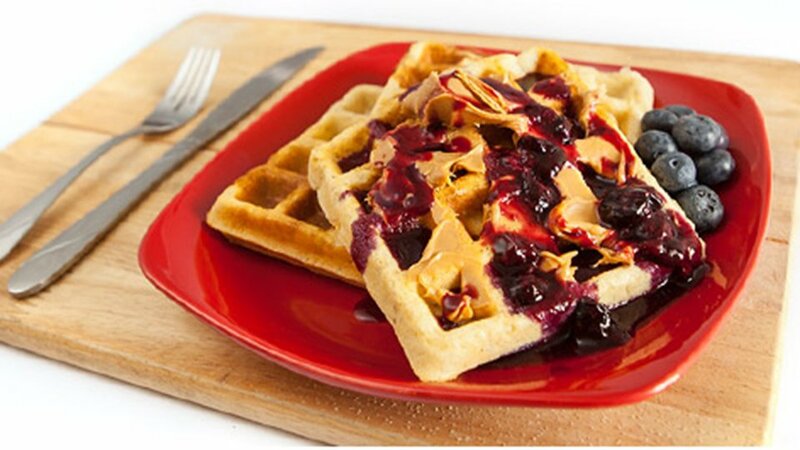 Whip up this recipe to get the delicious taste of PB&J in all the tasty waffle's nooks and crannies. For Waffles: Combine all dry ingredients in a large bowl. Slowly add wet ingredients while stirring. Let mixture sit for at least 10 minutes. Pour batter into waffle iron. For Jelly: In a small saucepan, combine blueberries, lemon juice, and Stevia. Cook on high heat until blueberries break down into a liquid.Plate by smearing a tablespoon of natural peanut butter on the waffle. Drizzle with homemade jelly. Enjoy!